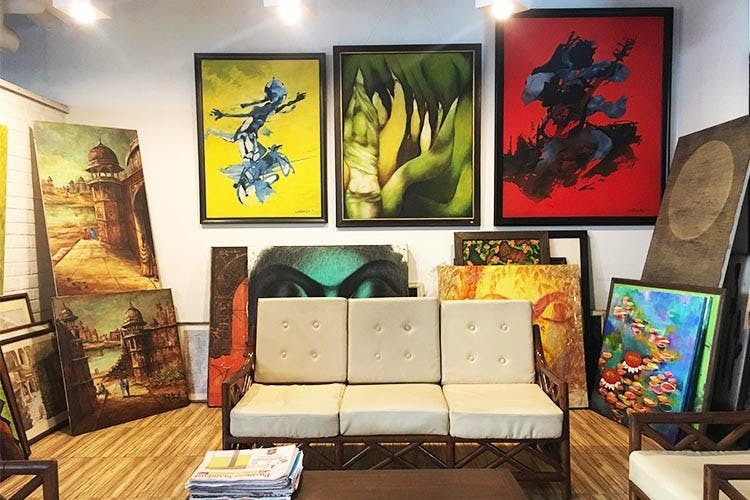 Every book and art lover would have visited Quill and Canvas in South Point Mall Gurgaon. This bookstore and art gallery has plenty of books, artworks that you can buy, stationery and now, a monthly book club. Old-time Gurgaon peeps will remember a time when the only decent place to get a picture framed was at a tiny corner store in Galleria. Old timers in general will remember a time when books were judged by covers, first pages, and GSM. Now they've got stationery, coffee and the nicest collection of artwork we've seen in a while. Now, we’re not here to talk down technology or nostalgically talk up the smell of parchment. The world’s changing; You can either lament or decide not to get left behind. But for the odd moment when our impulsive airport purchase fails us and we’re wondering what kind of read will manage to keep the pages turning, we’re so happy we can still walk through the aisles of Quill and Canvas. This remarkable growth is of course in some part due to our love for literature, but more so, because of smart adaptation to changing times by the owner, Shobha. She decided to flip things around so that art, which was earlier a smaller part of the business, is now fronting. Her intuition about her readers’ preferences also extends to the art part of the business. Quill and Canvas is now mostly canvas; It works as a gallery for showing, as well as purchase of artworks. She was supporting artists like Tirthanker Biswas and Vallery Puri long before they became big names. Good investments need good advisers; she’s yours. She can advise buyers about art that would pass a critic’s eye as well as hang comfortably in somebody’s home. A trait inherited from her publishing career when she used to commission authors, it comes down to picking the right ones, which works out great for us, if we are going to spend INR 30,000 or thereabouts on a piece for keeps. She's also started a book club that meets up once a month. We wish they'd open in Delhi too, we can't go as often as we'd like since it's in Gurgaon.